Your goal is to grow so strong on the inside that nothing on the outside can affect your inner peace of mind without your conscious permission. The ultimate measure of your wisdom and strength? How calm you are when facing any given situation. Yes, calmness is a human superpower. The ability to not overreact or take things personally keeps your thoughts clean and your heart at peace, which instantly gives you an upper hand regardless of your circumstances. Thus, the biggest and most complex obstacle you will ever have to overcome is your own mind. If you can overcome that, you can overcome almost anything. And by “overcoming,” I’m referring to the skill of mindfulness, and learning to effectively control your emotional responses to life’s unexpected tests. Because most of your deepest pain and frustration on a daily basis will come from the way you respond, not the way life is. Of course, being calm and mindful is easier said than done, especially when we’re under pressure in this day and age. High stress, relentless worry over work and life, and various forms of social anxiety are all a part of the modern way of being. Most of us just don’t feel any sense of peace or calm throughout the day, and are therefore depleted of energy and effectiveness in almost everything we do. I have to admit that Marc and I used to be exactly this way. The good news is, we have since learned to focus our minds more resourcefully, and so can YOU. Our biggest breakthrough came about a decade ago when we started leveraging five-second daily reminders to keep ourselves thinking better and living better. The reminders simply reinforce the core daily actions and rituals we know we need to engage in to remain calm and in control from the inside out. Although Marc and I have shared many of these five-second reminders with readers in the past, the reminders are scattered throughout various blog posts, subscriber emails, and chapters of our brand new book. So, today I’m putting 31 of my personal favorites in one convenient place for you to reflect on. Challenge yourself to pick the one new reminder every morning for the next month (roughly 31 days), write it down someplace you can easily see it (perhaps write it on a post-it note), and then consciously recite it (at least three times) as needed throughout the day. See how doing so prompts you to respond to life with a calmer and more effective mindset. Calmness begins the moment you take a deep breath and choose not to allow another person or event to control your thoughts. You are not what happened to you. You are what you choose to become in this moment. Let go, and begin again. Happiness is letting go of what you assume your life is supposed to be like right now, and sincerely appreciating it for everything it is. So, RELAX. You are enough. You have enough. You do enough. Inhale, exhale… let go, and just live right now in the moment. Be here. Just right here. No matter what, you can always fight the battles of just today. It’s only when you add the infinite battles of yesterday and tomorrow that life gets overly complicated. Calmness does not mean to be in a place where there is no chaos, trouble, or hard realities to deal with. Calmness means to be in the midst of all those things and still remain mentally, emotionally, and physically centered. Be selective with your energy. If you can fix a problem, fix it. If you can’t, then accept it and change your thoughts about it. Whatever you do, don’t invest more energy than you need, tripping over something behind you… or something that only exists inside your head. Remember, you alone get to choose what matters and what doesn’t. The meaning of everything in your life has precisely the meaning you give it. Most of the time the problem is not the problem—the problem is the incredible amount of over-thinking and over-analyzing you’re doing with the problem. Pause, and breathe, again. Life humbles us gradually as we age. We realize how much nonsense we’ve wasted time on. So, just do your best right now to feel the peace that flows from your decision to rise above the petty drama that doesn’t really matter. What you focus on grows. Stop managing your time. Start managing your focus. Positivity is a choice. The happiness of your life depends on the quality of your thoughts. And remember, being positive doesn’t mean ignoring the negative, it means overcoming the negative. There’s a big difference between the two. Life is too short to argue and fight. Count your blessings, value the people you love, and move on from the drama with your head held high. Calmness among chaos is a human superpower. Give yourself that power. Focus mindfully on what truly matters. You won’t always be a priority to others, and that’s why you need to be a priority to yourself. Learn to respect yourself, take care of yourself, and become your own support system. Your needs matter. Start meeting them. Don’t wait on others to choose you. Choose yourself, today! START making your happiness a priority. START making your happiness a priority. Give yourself the space to listen to your own voice—your own soul. Too many people listen to the noise of the world and get lost in the crowd. Tell yourself, “I am ENOUGH!” anytime you begin to feel like you aren’t. What we do in life ultimately comes out of who we believe we are. Don’t compare your progress with that of others. We all need our own time to travel our own distance. Just focus on the step you are presently taking. It’s OK to be low-key about the step you’re taking today. You don’t need to put everything on social media. Silently progress and let your actions speak for themselves. A decade from now it won’t really matter what shoes you wore today, how your hair looked, or what brand of clothes you wore. What will matter is how you lived, how you loved, and what you learned along the way. Sometimes we get so caught up in trying to accomplish something big, that we fail to notice all the little things that give life its magic. Keep your eyes open for blessings in disguise. They are everywhere. And they are worth gathering into your awareness. Take life day by day and be grateful for the little things. Don’t get caught up in what you can’t control. Accept it and make the best of it. When you stop worrying about what you can’t control, you have more time to change the things you can control. And that changes everything in the long run. It’s not too late. You aren’t behind. You’re exactly where you need to be. Every step and experience is necessary. Think of all the hundreds and hundreds of little steps and missteps and chances and coincidences that have brought you here. In a way it feels like the biggest miracle in the world, doesn’t it? Keep this in mind, and meditate on the fact that you are a work in progress, and every great success requires some kind of struggle to get there. Life changes every single second, and so can you. Every moment gives us a new beginning and a new ending. You literally get a second chance every second. Head up, heart open. To more peaceful and productive moments approaching! Choose to find calmness within yourself, and make it your superpower today. Which reminder mentioned above resonates with you the most today, and why? I resonate deeply with the reminders you’ve shared here and I will use them as morning affirmations starting tomorrow when I first awake. But I also want you to know how much I deeply connected with the way you ended this write-up–specifically the challenge to choose a different response to life. Too often I find myself fighting against situations, relationships, and realities in my life that aren’t in line with my expectations. I spew negativity far more often then I even realize, and quite honestly I think lots of people I know do the same exact thing. We get offended and upset rather than opening ourselves to the possibility of making the very best of things. Anyhow, I’ve been a long-time reader of your work, and my husband and I sit down together every weekend and use your articles, emails and excerpts from your books to reflect on our lives. Thank you, again, for all that you two do. I love what you said about being here now with presence and acceptance, and the notion of looking at what you have rather than what you do not. And I also like how you frame the idea of calmness being the foundation to making progress. Honestly, this is what your Getting Back to Happy modules and coaching have helped me with most. In the past I’ve been a victim of my own negativity. I’ve literally held myself back simply by telling myself it’s not going to work, or that it’s too late, or that I’m not good enough because of some past situation. Thus, I appreciate these reminders. They are calming and centering for my thinking. And truly, I’ve come a long way recently, but reminders always help me stay on track. 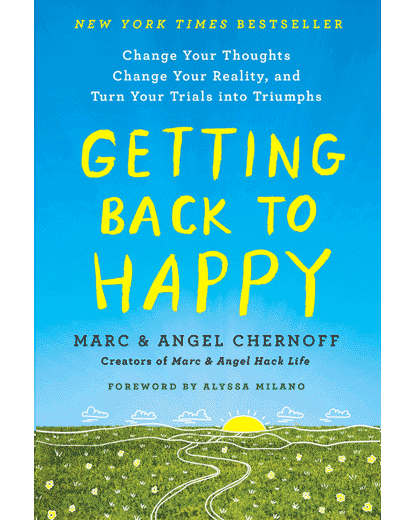 And Marc and Angel, your work is often the source I turn to most frequently when I meed an extra push in the right direction. Thank you. Five-second reminders! Love it! These help. Even when times are stressful, my top strategy is to stop myself from complaining, to reflect for a moment and calm myself down. I just do the absolute best I can in the moment, one tiny breath or step at a time, just as you mentioned in #20. This is probably the most important strategy for living I’ve picked up from your course and coaching (although there are several others) — it is indeed a strategy — a daily habit — I use every single day of my life. Thanks as always. And I’m looking forward to re-watching your 2018 conference recordings from in San Diego. I was there live and I see you just emailed me access to the recordings. Blessings. I have just found your site and plan to spend a lot of time reading here. I desperately need CALMNESS, more POSITIVITY, more JOY, and less STRESS in my life! So many past experiences (plus the way I was raised) have taught me to look at the cup as half empty but I desperately want to see it as half full. Thank you for the work that you do. Now I’m off to read more. Thank you very much for the wonderful message. Some insightful principles I hope to remember for a lifetime. Truly, the ability to stay calm in tense situations is the real super power. I loved the part of “stop managing your time, and start managing your focus.” I am going to apply this to my life. Thank you so much, M&A. This article arrived in my email just on time. I really needed it and as if I called you concerning my situation right now. Honestly, you’ve contributed a lot in making my day. It’s always a pleasure to read your words. Wonderful thoughts to start my week ..bless you. Presently I am going through your article 16 simple ways to love yourself again. Studying it closely and gradually to adopt fully. The 31 reminders in above article are such good reminders of our daily needs to remain calm, content & happy. I am going to read & remind me these daily till I memorize by heart & Start practicing spontaneously. I feel as though we all know each other though we’ve never actually met. Thank you again. As soon as I’m able I am going to get your new book and hopefully be able to participate in a course or a one on one with you guys. Your article is so timely, thank you! We broke up last month with my boyfriend after 3 years and we are still living together while I find a new place, which, needless to say, is very stressful. Amazingly, I have remained very calm and focused which seems to make his anger worse. I feel like his anger is his end, not mine…. I remain respectful while he rants, lies, manipulates…. I feel like I am made out of granit, his negativity cannot affect me. I realize how much I have grown, in part thanks to you, thank you from the bottom of my heart. Love the notion of what you focus on grows. So stop managing my time and start managing my focus. 💖💖💖 this article is all we need on a daily basis to live our best life possible! Thank you Marc and Angel! I’m so grateful for your articles!! Omg I had tears in my eyes reading 16. Make myself a priority. I always put others first. My partner has just ended our relationship, even though I put everything I had into it. I do this with all relationships and it’s exhausting. I was not a priority to him. So when I read that it hit me hard!!! My needs matter. Yes they do. Thank you guys for such inspiration. #16 really caught my eye. Through most of my life I was always told that I should put other people first. From my experience, if you keep putting other people first, the less they appreciate you and anything you do for them. No wonder I felt bad for myself. I bet that the people I have gone out of my way for in past years would never acknowledge me today, so it’s best to move on and be ME. #13 also stuck out. People who are mean or angry because they do not get what they want. It made me think of some of my teachers in grade school. The weren’t disciplining, they were mean-spirited. Everyone should have an option to walk away from bad situations, but children and even teens don’t necessarily have that option when it is in a controlled area, like a classroom. I have always thought in the back of my mind that if you take something away from a person, they might change (their behavior) if you are important enough to them. An example that I can remember is when I used to walk to school with some neighborhood kids. They would always run to school, and I could never keep up, and they would never wait. I decided after some time, that I would not walk to school with them anymore. I always made sure that I left my house at a different time so that they would not see me. Then about a week or two later, one of the kids came to my house before school to see what had happened. I told her it was because I was sick and tired of always having to tun to keep up with them, and they stopped pulling (that crap). I still wonder if she came to my house on her own or because her parents told her. My mom never asked me anything, so I am guessing that she never found out about it. Your advice always hits home for me. My husband and I are trying to make some very life-altering decisions about his cancer right now, so reading what you guys write is always comforting to us. Yes you can do all these things which are helpful, or you can just let Christ into your life and you will find these things are already done for you. I ageee with you JRS5- Jesus is the Lord of my life too. However, God put people like Marc and Angel on this earth to provide different angles on things- a very practical list of reminders that can and should be rooted in your Faith in God, His timing, His Plan. Perhaps the best advice I’ve seen so far. Precise, compact, and most importantly…….so easily digested. Just-THANKS, BLESSINGS and how insightful ! I’ve also noticed that when I focus on my worries I lose my balance, when I focus on my balance I lose my worries. We hear this comment so often: ” I am having a bad day”. Or we say it ourselves. But is it really? Or is it just one bad moment in a very good day? I remind myself of this if/when that thought arises. Why would I want to waste an entire day-the only one I will get with that particular date-feeling that way?! Onward . . . Number 3 did it for me. Be here. Just right here. No matter what, you can always fight the battles of just today. It’s only when you add the infinite battles of yesterday and tomorrow that life gets overly complicated. So true! I’m always adding the battles of yesterday and tomorrow. I am grateful to read this article, today. The entire list came at just the right time! But especially #’s 15, 16 and 19. I’ve just been forced to resign from my job because of what I truly feel was age discrimination. I’ve been up and down with my emotions, thinking how could they treat me so unfairly and hostile after how nice I’ve always been toward them. I have to drive pass the worksite every day because it’s on my normal route; with this list, I have a new strategy to deal with the emotions I feel when I go by. Thanks for your time and concern for the well-being of others. Blessings to you. Thank you so very much for these powerful reminders. Love #2. I started memorizing it so I can remind myself at all times. That I am enough and to live in the moment. Well done, every single number and word placement. Thank you for 31 concise right-minded thinking choices for good health. Waves of love’s peace and good vibrations. I FIND THAT ALL THE 31 POINTERS ARE RELEVANT ALMOST ON ALL DAYS FOR ME! Thank you. If it’s ok with you, I’d like to hand out your article to some of my clients. I work as a mental health therapist and all of these reminders are wonderful and relevant. YAAAAAY!!!!!! YOU GUYS ARE THE REAL G!! Thank you Marc and Angel. This is the first time I have posted but I suddenly felt the need to leave a reply. I read from 31 upwards (just to be contrary) and had to stop at number 30…because it resonated with me and will help me refocus/repurpose my current mental fight to be positive. I have moved several thousand miles in the last month and have left my comfortable surroundings/life/friends/support behind. And now I am struggling to see why I did that to feel this miserable. But as you say life keeps leading us on journeys we would never go on if it were up to us. I will have faith.I am grateful that I have your words in my inbox. warmest thoughts to the whole community. Thank you for creating this piece on calmness. I needed that today—–I will share with my network and “I choose to live your advice starting today”. I’m not quite good at sharing my experience online but I definitely need this kind of words daily. I’ve always asked “why am I never appreciated?”, “when will it be that someone treats me as special as I treat others”. I’ve sometimes thought, the more I give, the more miserable I become. Yes, it’s a choice I made and kept on doing so why choose to be unhappy with that choice when no one asked you to do it? I’ll certainly be reading all lessons you’ve thought here. Already subscribed to the newsletter too. Thank you for delivering your message precisely.